Maria 01 is a community and space. A League of tech entrepreneurs and investors building the future. Maria 01 members occupy 10 000m2 of space in the former Maria hospital. Originally the first public hospital in Helsinki, with the first female doctor in the Nordics. Maria 01 is part of Corporate Start-up Co-creation project aimed to develop a new community of companies and create new models of startup-corporate collaboration. Community house Maria 01 in Helsinki is home to promising tech startups, investors and other startup organizations who get to enjoy the nourishing environment to develop their businesses. Having attracted a wide amount of interest, Maria 01 is able to carefully select its startups. Maria 01 mainly chooses startups that have already launched their product and are going to the market, with pre-seed to seed funding. “We love full-bodied and ambitious technical product teams. We try to choose startups who have already launched their product and are going to the market, with pre-seed to seed funding already in place. Some early traction also helps.” CEO of Maria 01 Voitto Kangas explains. “The biggest smile I’ve had was when a founder talked about how electrified his team was about moving to be part of the community. In the startup circles we usually glorify the founders, and forget how much the first employees take risks by joining an early-stage company” Kangas argues. GuardianX – improve personal safety with a single swipe. Have you walked in a dodgy park, secretly hoping that there would be someone with you? GuardianX is a safety solution in your pocket, providing you with the peace of mind. GuadianX users’ see other nearby users feel safer, can alarm their contacts and near by users in the case of emergency and have someone virtually walking you home. Approximately 4.5 billion people live without a state provided emergency service or number even though physical integrity and personal safety are declared as basic human rights by United Nations. GuardianX is a revolutionizing solution for a safer tomorrow. Let’s face it – self-driving vehicles are the future. AImotive wants to make them available everywhere in all kind of driving conditions. aiDrive will make decisions that assure safety and comfort throughout the ride. The piece of technology constitutes of four software engines taking care of recognition, location, motion and control matters. In January 2015 – AImotive team showcased their self-driving prototype car at CES: this was the first self-driving car driven by an embedded application processor and in July 2017, AImotive received self-driving test licenses for California and Hungary, while having a third one in Finland since February. Considering that we spent a giant junk of our time at the office, our work environment matters. That is why Naava was founded to revolutionize the air we breath. The green wall naturalizes indoor air, decreases the amount of harmful chemicals and optimizes humidity. As a result, illnesses will reduce, fatigue is halted and cognitive performance is enhanced. Imagine a YouTube for podcasts. Kieku uses artificial intelligence to create playlists that you love. The application learns quickly about your preferences based on what you listen, skip and like. Thus finding enjoyable and brainy content has never been easier. Kieku also enables you to to start broadcasting yourself. “We believe Kieku is a much needed new way to share and listen to audio content you like. You can follow your favourite authors or listen to what Kieku’s AI selects for you”, says Juho Pennanen, Data Scientist from Kieku Labs Oy. Say goodbyes to plastic bags, it’s time to start using reusable packaging in ecommerce. By simply returning the package to the mailbox, the customer will be rewarded with a voucher. You will not only be saving money but also the environment. 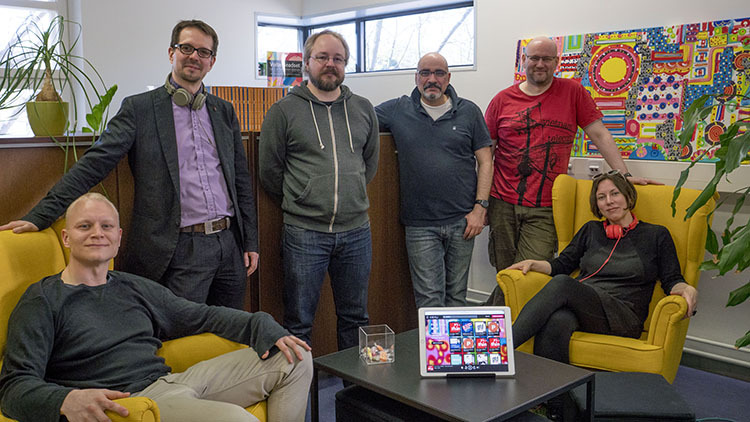 Silver Entertainment is a startup developing and publishing virtual reality and mobile games. Being founded by the former Angry Birds team, Silvermile Entertainment has the required know-how and extensive industry experience. Their first two games – Space 2020 and Flushy Fish VR – are ready to charm families with the futuristic visuals. Although collecting data is hot, the crucial step of interpreting the numbers is not given nearly as much emphasis. Lucify helps organizations to make data more visual, understandable and easily communicable. Lucify was founded in 2015 by Juho Ojala, Ville Saarinen, and Ville Väänänen. The company is fully owned by its employees and is based in Helsinki, Finland. At Lucify, we believe there’s vast untapped potential in the digital medium. Lucify’s work has been supported by Helsingin Sanomat Foundation and the Google Digital News Initiative.